We’re looking for 25 companies that have raised already seed or series A funding to join us at Startup Europe Summit, 21st-22nd March. Travel (economy) and accomodation (2-3 nights) costs will be covered for one representative from your country to Cluj-Napoca. Possibility to pitch in front of an expert jury. The selected entries will have about 10 minutes to pitch, followed by a Q&A session. All pitching participants will be rewarded with access to top investors – something that can really mark a milestone in your entrepreneurial life! The companies the jury members represent are: AXON, Early Game Ventures, Index and Atomico. More details will follow. We welcome applications from Poland, Bulgaria, Hungary, Romania, Czech Republic, Slovenia, Slovakia and Croatia. Startup Europe Summit is an event that brings together the leading players in technology entrepreneurship and innovation. This year, the summit will take place in Cluj-Napoca, Romania in light of the Romanian Presidency of the Council of the European Union. At the Summit you will be able to join thematic workshops, network with venture capitalists, engage with policy makers and learn how to grow your business abroad. Startup Europe Summit draft agenda. MY-GATEWAY EMBRACES THE NEW YEAR WITH A GOLDEN TICKET TO STARTUP OLÉ. What did you write in your New Year’s resolutions list? Did you wish for happiness, travelling to a Western European country, attending startup events, meeting new investors..? If this is the case, I’m thrilled to announce that Startup Olé is looking for 15 CEE startups to join the event! Yes, you read it well: 15 startups! MY-GATEWAY will help detect those Central and Eastern European startups that will benefit the most from attending the Spanish event, making sure startups are well aware of the opportunities they can be catered for. The target of our contest are startups based either in Romania, Czech Republic and Slovenia. Those startups will need to really convince and tell us why they think Startup Olé can help them out boost their business growth, and, of course, send us a pitch deck. Attending Startup Olé can be a truly enriching experience… as you long as you prepare well for it! By using the Startup Olé app, you can gain access to investors, corporates, mentors and set up meetings with our fellow attendees. To make sure you stand out as you deserve, you’ll be provided with a whole stand to show your product and sell it to your target, so do come prepared with merchandising and flyers that can help you achieve your objectives! And…did I already say that travel and accommodation costs are included for one representative of your team? We really don’t want the distance, and its costs, to be a problem. That’s why travel and subsistence expenses are entirely covered by us. Last but not least, some of the startups which will go through our selection process will also gain the possibility to join the PITCHING competition. 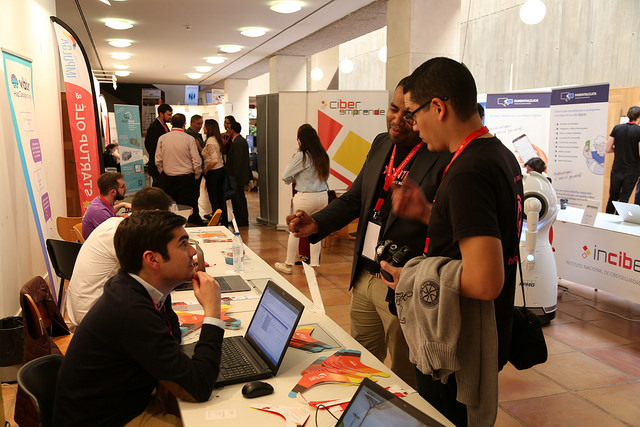 Startup Olé 2019 will take place in Salamanca (Spain) from 26-29 of March and it will gather +30.000 attendees from 120 countries; +850 startups, scaleups and spin-offs; +500 speakers; +250 corporates and investors with an investment portfolio of over €50k M. Our fifth edition will be the biggest so far and we are working hard to make this an event that you will never forget, so do not wait any longer and join the family! The 3rd event of the DeepTech4Good Acceleration Programme is coming soon! You are a high-potential startup, go in search of funding and be one of the programme’s winning startups. Date and venue: 26th of March, 2019. Messecongress Graz, Messeplatz 1, 8010 Graz – Austria. DeepTech4Good (DT4G) is an Acceleration Programme, financed under the Horizon 2020 framework, committed to help DeepTech Startups accelerate their development and scale up at European level. DT4G is led by 4 innovation hubs from Germany, France, Austria and Spain, working together to identify high potential DeepTech Startups. In 2019, the YTILI Fellowship will engage young European entrepreneurs in a series of professional development and leadership activities that are designed to support the growth and development of commercial and social business ventures in their home communities. The fellowship includes an Opening Summit in Europe, a week-long experience in a U.S. host city, a Closing Conference in Washington, DC, and online engagement-training opportunities. The 2019 YTILI Fellowship year runs from April 1, 2019 to October 31, 2019 with U.S. travel components planned for September 2019. A detailed overview of the program elements, participation requirements, and expectations is available below in the Resources Section of our site. Join a growing network of dynamic European entrepreneurs committed to enhancing the transatlantic relationship and contributing to the growth of entrepreneurial ecosystems in their home communities. The 2019 YTILI Fellowship year will commence on April 1, 2019 and conclude on October 31, 2019. The cohort of fellows will engage in a robust program of in-person and virtual engagement during this time, including travel to the United States, which is the centerpiece of the fellowship experience. The full 2019 YTILI cohort will be connected virtually in pre-departure activities, an online platform, and at the opening summit in The Netherlands. Additional pre-departure and post-fellowship activities may be offered by individual U.S. embassies and consulates in the fellows’ current countries of residence. The following section outlines the main elements of the YTILI fellowship administered by GMF and its partners. Registration for DeepTech4Good#Stuttgart now open! 23 European startups will pitch and meet corporates, European VCs to scale up and become the future European Deeptech unicorns! Fundraising pitches: 23 startups selected by the consortium will pitch their business idea in front of the audience and get feedback from the board of evaluators composed of VCs, investors and corporate players. Business speed dating with corporate players and investors will focus on providing startups market access and financing opportunities. Open innovation workshops: On the 4 specific markets, qualified potential partners (startups, SMEs, corporates, researchers, and academics) will join to discuss challenges along defined value chains and be part of a general mapping session of business opportunities. Exhibition: Every startup has the possibility to exhibit with a booth. Job board: Collects job offers from Europe´s most important job boards. For the full programme and an overview of the startups who will attend, have a look here. DeepTech4Good#Stuttgart is an event organized by Steinbeis 2i GmbH and Photonics BW in cooperation with the Photonik-Forum Baden-Württemberg. July 24, 2018 – MY-GATEWAY holds an open application to give away free Web Summit tickets to ten startups based in or focused on Central Eastern European countries until July 27th. MY-GATEWAY is searching for the 10 most innovative and disruptive startups to join the MY-GATEWAY delegation at this year’s Web Summit in Lisbon, Portugal from November 5th to the 8th. A committee comprised of leading startup support organisations from Romania, Slovenia and Czech Republic will select the 10 startups through specific criteria.Some of the criteria include:having a developed idea, a financial plan and being based in or having a strong interest to work in the CEE region. Would you like to apply? Click here. As the largest tech conference in the world, with over 70,000 attendees, 1,200 speakers and 170 countries represented, Web Summit is the perfect event to gain exposure. The affair will consist of 3 full days of keynotes, workshops, and networking opportunities. In attendance will be a vast investor ecosystem,as well as over 2,500 international media outlets. MY-GATEWAY is an initiative created by a team of experts who are passionate about improving the startup industry in Europe, specifically in the CEE region. With the aid of Startup Europe, MY-GATEWAY is helping startups gain insight into growth opportunities, access a vast stakeholder database and be represented at major startup related events. Additionally, this project will contribute to the expansion of Startup Europe to the Balkan region as well. This will be done through collaboration with leading startup support organisations in Serbia, Macedonia and Bosnia by analyzing how to adapt to the needs of the Balkan ecosystems. “The driving force behind MY-GATEWAY is to make them connected, to let them learn from each other and to come up with meaningful activities that will help them support their startups”, says Tóth. MY-GATEWAY is an initiative of Startup Europe that aims to strengthen the capacities of high-tech start-ups and innovative SMEs in the CEE region to become better connected, gain higher market exposure, and have improved, streamlined access to funding opportunities and talents. For more information visit us at http://mygatewayproject.eu/ . I want to attract your attention to DeepTech4Good#Stuttgart – our second business event of the DeepTech4Good Acceleration Programme which will take place on November 7th 2018 in Haus der Wirtschaft, Stuttgart. The first Startup Europe Ambassadors group were publicly presented during Startup Europe Campfire event held in Paris on 19 March. They represent a group of key influencers in the European startupe cosystems who will provide information and advice about the European Commission’s Startup Europe initiative. The objective is to democratise the startup phenomenon so that every European citizen has a fair chance to become a successful entrepreneur. The ambassadors will also help startups in their growth phase to have access to all the opportunities offered at European level. Throughout the years, European Commission’s Startup Europe initiative has become a top reference in the European startup related field, by supporting directly around 60 local ecosystems and over 750 startups to grow beyond borders. The mission of Startup Europe is to build a Startup Continent by connecting pools of talent. The initiative encourages entrepreneurship, startup creation and growth; and connects startups, investors, accelerators,corporates, universities and the media through an array of grass roots initiatives or networks. The Startup Europe Ambassadors will actively contribute to the visibility of Startup Europe activities at the local level by acting as a key information point in their countries and also as connector for the local ecosystem with the other startups ecosystems across Europe. The first members of this group are the organisations who have been selected through the evaluation of proposals of European Commission’s Horizon 2020 ICT 32 call, as well as partners of European funded projects WeP UP! or OpenMaker. Startup Europe Summit 2018 (European Commission’s foremost technology policy conference for startups, 15 October, Sofia). Press release on European Comission website. SEW partners up with F6S making an even cooler Startup Europe Week! To manage this growth, we have partnered with F6S, another young team passionate about entrepreneurship. As the world’s largest tech founder and startup community, they have 2.35 million profiles, including over 890,000 startups and 15,000 partners. SocialChallenges.eu is looking for entrepreneurs! Launched in December 2016, the Social Challenges Innovation Platform is the brand-new initiative funded by DG GROW and EASME dedicated to Social Innovation. It has been designed to exploit the untapped social innovation potential of European SMEs in addressing complex micro and macro societal challenges affecting European citizens. 30 challenges have been collected across Europe and given visibility on our platform, and we are now looking for entrepreneurial solutions able to meet these needs. We are looking for you! Apply now! There is time till the 21st December to propose a solution online and enter the evaluation process that will result in the selection of the most promising and feasible solutions that will receive 30.000€ to develop over a 6-month period a Minimum Viable Product, in collaboration with the challenge owner and local stakeholders. France, Portugal, Italy, Cyprus, UK, Bulgaria, Romania, Germany, Austria, Netherlands, Spain – check out the places active on the map! Health, aging population, environment, food, education, employment, youth, social inclusion, smart cities, mobility, refugees and migration – filter your search by theme and apply for those challenges you think your solution could answer to. In any case we recommend you to have a look to all the challenges now online; themes are not exhaustive as many challenges address different themes at once, and the geographical scope doesn’t impede entrepreneurs from other countries and regions to apply. That’s why we have prepared a booklet briefly presenting each challenge. Check it out! Once you spot the challenge you want to apply for, create your profile and start preparing your pitch. Here is a step by step video-guide showing you how to navigate the platform and upload your pitch (proposal). SocialChallenges.eu aims to help those with a social challenge to reach out a wide range of potential solution providers, and at the same time to provide European entrepreneurs with a scaling up platform helping you grow your business and your social and environmental impact. Don’t forget to check our Twitter account and Facebook page: new highlights every day!